and he shares in all our gladness. to the place where he has gone. bright like stars, with glory crowned. when we also are God’s children? Because Christ alone is the eternal, natural Son of God. adopted by grace through Christ. To help children understand the Apostles' Creed words "who was conceived by the Holy Spirit, born of the virgin Mary," Cecil F. Alexander wrote this text and published it in her Hymns for Little Children (1848). 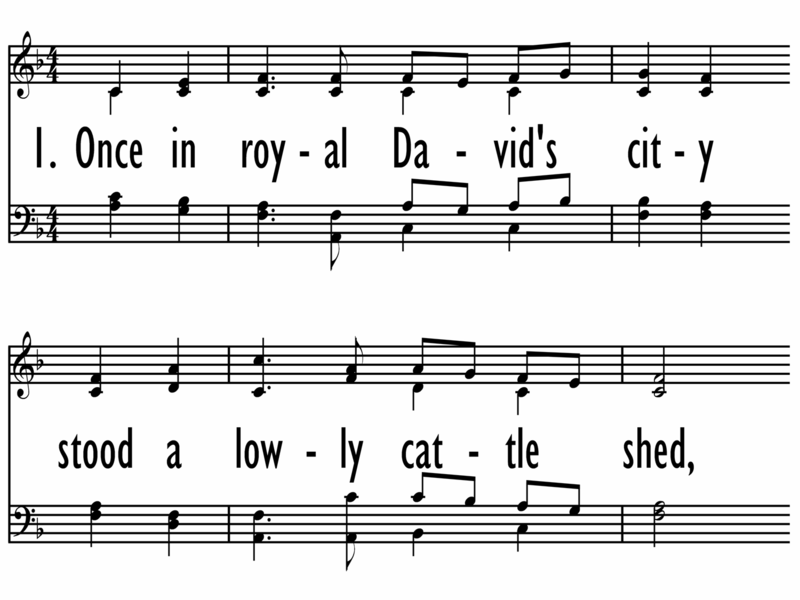 Five of her six stanzas are included; the third stanza is omitted. A good mingling of the biblical story and Christian theology, the text sets the nativity of Christ into a much larger framework-the history of salvation. Alexander's words enable us to look back and to look forward from this historic event. Stanzas 1 and 2 recall Christ's humble birth. Stanza 3 focuses on Christ's childhood and identity with humanity. Stanzas 4 and 5 look forward to the sharing of Christ's glory with his children. 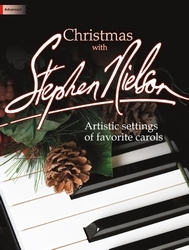 Henry J. Gauntlett composed IRBY for the text and published it in the pamphlet Christmas Carols, Four Numbers (1849) in a unison setting with piano accompa­niment. 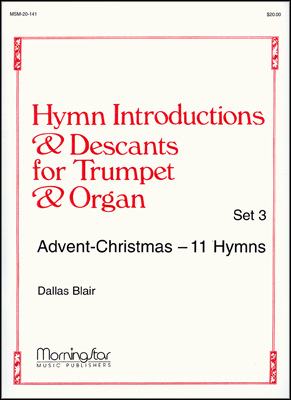 Because of the hymn's traditional use (since 1918) as a processional hymn for the annual lessons and carols festival at King's College, Cambridge, various composers have provided glorious harmonizations for the tune. In the King's College festival a boy soprano sings the first stanza unaccompanied–a stunningly beautiful effect! Named after a village in Lincolnshire, England, IRBY is a graceful tune that returns to the tonic in five out of six phrases. It is in rounded bar form (AABA). This hymn is a good candidate for antiphonal singing. Try having the children sing stanzas 1 and 3, the choir or full congregation sing stanzas 2 and 4, and the entire group sing stanza 5 in unison, with the choir singing the descant. As a small girl, Cecil Frances Alexander, (Humphries) (b. Redcross, County Wicklow, Ireland, 1818; Londonderry, Ireland, 1895) wrote poetry in her school's journal. In 1850 she married Rev. William Alexander, who later became the Anglican primate (chief bishop) of Ireland. She showed her concern for disadvantaged people by traveling many miles each day to visit the sick and the poor, providing food, warm clothes, and medical supplies. She and her sister also founded a school for the deaf. Alexander was strongly influenced by the Oxford Movement and by John Keble's Christian Year. Her first book of poetry, Verses for Seasons, was a "Christian Year" for children. She wrote hymns based on the Apostles' Creed, baptism, the Lord's Supper, the Ten Commandments, and prayer, writing in simple language for children. Her more than four hundred hymn texts were published in Verses from the Holy Scripture (1846), Hymns for Little Children (1848), and Hymns Descriptive and Devotional (1858) . When he was nine years old, Henry John Gauntlett (b. Wellington, Shropshire, England, 1805; d. Kensington, London, England, 1876) became organist at his father's church in Olney, Buckinghamshire. At his father's insistence he studied law, practicing it until 1844, after which he chose to devote the rest of his life to music. He was an organist in various churches in the London area and became an important figure in the history of British pipe organs. A designer of organs for William Hill's company, Gauntlett extend­ed the organ pedal range and in 1851 took out a patent on electric action for organs. Felix Mendelssohn chose him to play the organ part at the first performance of Elijah in Birmingham, England, in 1846. Gauntlett is said to have composed some ten thousand hymn tunes, most of which have been forgotten. Also a supporter of the use of plainchant in the church, Gauntlett published the Gregorian Hymnal of Matins and Evensong (1844).